Destroy Workouts with Unparalleled Energy! Increase and Preserve Muscle Mass! Propel Workouts to the Next Level! FINAFLEX® proudly introduces STIMUL8™, the ultimate High Performance Pre-Workout product powered by a Thermogenic Ripping Matrix that delivers extreme results! STIMUL8™ is built with ingredients designed to propel workouts to the next level. 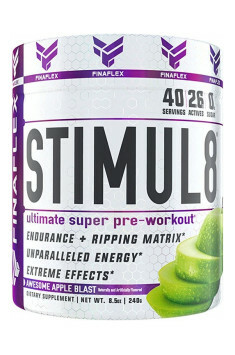 STIMUL8™ allows users to experience unparalleled energy while also experiencing enhanced endurance, strength, and power. STIMUL8™ features IRISINXD™ a Patent Pending blend of exotic stimulants featuring N-Coumaroyldopamine (a selective beta 2 adrenergic agonist), combined with the most effective COMT (Catechol-O-Methyl-Transferase) inhibitor to increase the bioavailability and overall effectiveness of N-Coumaroyldopamine (a.k.a. NCD) in the body. Without the COMT inhibitor, the awesome power of NCD cannot be realized because it is rapidly metabolized by COMT once introduced. Is it possible to burn fat while preserving and increasing muscle mass? With IRISINXD™, the answer is YES! Ingredients that make up IRISINXD™ have been shown in recent studies to benefit and support the body recompositioning phenomenon. Naturally occurring N-Coumaroyldopamine, a Beta 2 Adrenergic Agonist is as effective as some pharmaceutical counterparts at stimulating cAMP. Beta 2 Adrenergic Agonists decrease fat by stimulating B2-adrenoceptors in cells in the body. Beta 2 Adrenergic Agonists have anabolic effects, which stimulates muscle growth in young men. Beta 2 Adrenergic Agonists have potential to alter skeletal muscle function. Beta 2 Adrenergic Agonists can restore muscle mass and strength. BETA ALANINE – The Ultimate Sports Nutrition Ingredient? Beta Alanine is a naturally occurring amino acid found to have a multitude of benefits as a Sports Performance supplement. Beta Alanine has been shown in various human studies to be effective in increasing endurance, strength, and power in users. STIMUL8™ features a significant dose of Beta Alanine per serving, allowing users to experience its awesome power as a Sports Performance ingredient. Recent studies in 2013 continue to solidify Beta Alanine as an incredibly robust Sports Nutrition ingredient. Beta Alanine supplementation has been shown to increase exercise capacity and performance. Beta Alanine elevates muscle carnosine content, improving performance in high-intensity exercise episodes. Beta Alanine supplementation for 28 days improves performance in recreational runners. FINAFLEX is dedicated to the development of sports nutrition supplementation. Owners FINAFLEX started the company to introduce on the market the supplements, which cannot be compared with any other manufacturer. Phoenix logo represents the rebirth of diet supplements, beginning with the introduction FINAFLEX 550-XD. Since then FINAFLEX extended their offer of advanced bodybuilding and weight loss supplements, which give real results!